The Microtech Stitch is a production version of the Custom knife collaboration between Marfione and Borka Blades. 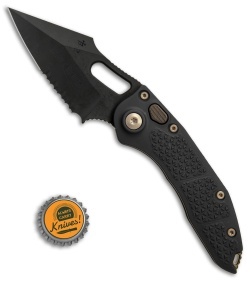 This model sports a partially serrated, Apocalyptic DLC finished blade and a knurled alloy handle with a black finish. 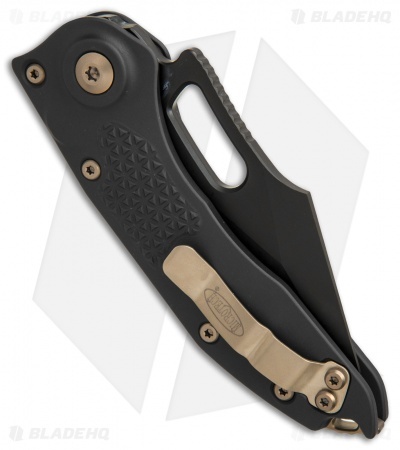 It comes fitted with bronzed hardware and a secure right hand tip-up carry pocket clip. Spear point style blade with substantial choil and thumb ramp provide an excellent cutting platform. Anodized aircraft alloy handle offers a strong, lightweight frame with a knurl textured grip. Heavy duty firing button and plunge lock rockets the blade into open position and locks up tight. This blade should be 2017 / 2018 Blade of the Year. Auto works flawlessly and Blade Rockets out with solid force. Attention to detail and craftsmanship is custom worthy, built like a tank. Blows my Medforda out the water. Funna buy me a third, maybe even purchase whole set. I sure hope they come out with a manual. 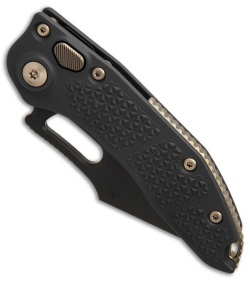 Don’t think twice, this Stitch is everything a tactical and utility knife should be. Thanks Blade HQ, even got me Microtech Cool Beanie with second order. Stitch “Blade of the Year”!